Conflicting research has questioned the ability to have a healthy gluten-free pregnancy, but if you have celiac disease, non-celiac gluten sensitivity, or you just feel better when avoiding gluten, you can, in fact, achieve proper nutrition while expecting. Some sources state you must consume processed foods with fortified nutrients to get adequate amounts of synthetic folic acid and fiber, but if you adhere to a gluten-free nutrition plan that is based on whole foods, your macro- and micro-nutrient intake will be most beneficial for mother and baby. Here are five tips to help you have your healthiest gluten-free pregnancy, and a quick return to your pre-baby body. Yes, you need carbohydrates while expecting and choosing green vegetables and low-sugar fruits (as opposed to gluten items such as bread, pasta, and cereal) can be extremely advantageous during pregnancy. Gestational diabetes (GD) affects up to ten percent of all pregnancies so eating low-glycemic carbohydrate foods such as leafy greens and berries will provide energy, as well as substantial amounts of naturally occurring vitamins and minerals. Not to mention, these items will not raise your blood sugar in the same manner that gluten foods will, which may put you at lower risk for GD. Fat consumption is essential for your growing fetus, and the most superior fats will come from gluten-free foods. Omega-3 fatty acids found in egg yolks, wild salmon and walnuts assist with fetal eye and brain development. Monounsaturated fats found in extra-virgin olive oil and avocado contribute to overall wellness as they have been found to help lower bad cholesterol. Not only are these fats remarkable in terms of fetal development and heart health, they help to keep you fuller for longer which may fend off pesky pregnancy cravings. The best proteins for pregnancy (and beyond) also come from gluten-free sources. Choosing the highest quality protein sources is critical, so eliminating items such as hot dogs and deli meats is a good idea during this time. If possible, it is best to opt for organic selections of meat and poultry, and wild seafood as these will have less environmental toxins. The amino acids found in proteins are the building blocks for your growing baby so if you are vegetarian or vegan, you will want to pay close attention to your protein intake. Consuming foods such as peas, lentils, beans, nuts, seeds, quinoa, spinach, and broccoli will fulfill your protein requirements while also providing a variety of other micro-nutrients. Just keep in mind that animal proteins provide the most vitamin B12 so if you are vegan, you may want to speak with your doctor or midwife about supplementing. It is common misconception to think that pregnant women need gluten foods such as fortified breads and cereals to obtain the proper amounts of folic acid and fiber. Folic acid is the synthetic form of naturally occurring folate, and it is added to many gluten foods but 40 percent of the population can’t metabolize the synthetic version. Naturally occurring folate is more easily absorbed, and found in a variety of gluten-free foods such as legumes, Brussels sprouts, asparagus, avocado, kale, broccoli, and oranges. It has also been stated, time and again, that we need foods such as whole wheat bread and pasta for fiber but when you compare the fiber-to-calorie ratio in gluten foods to gluten-free whole foods, breads and pastas are actually inferior. For example, to get an 8-gram serving of fiber, one must consume four pieces of whole wheat bread which amounts to 276 calories and 48 grams of carbohydrates. If one chooses a gluten-free food such as raspberries, she will only need to consume 65 calories and 15 grams of carbohydrates to get that same 8-gram serving of fiber. You have probably noticed that your grocery aisles have been inundated with the multi-billion dollar gluten-free processed food industry. Just because a label says “gluten-free,” it doesn’t necessarily mean it is healthy. In fact, gluten-free processed foods simply replace wheat flour with ingredients such as corn starch so the carbohydrates found in these products will cause spikes in blood sugar, which is not ideal while expecting. Also, like their gluten-filled counterparts, many of these gluten-free processed foods have an abundance of additives and preservatives to promote long shelf lives. Proper gluten-free nutrition during pregnancy can seem complicated, but following the basic rule of sticking to whole foods that are unprocessed will take most of the guesswork out of the equation. Fortunately, there is a wide variety of naturally occurring whole foods that are gluten-free, boasting all of the vitamins and minerals needed for the prenatal food regimen. 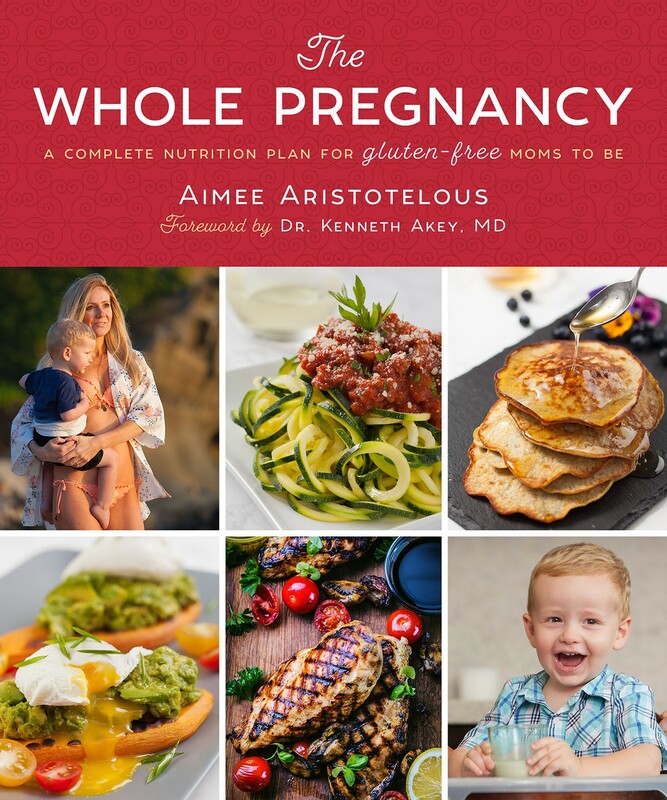 Aimee Aristotelous is a certified nutritionist, specializing in prenatal dietetics and gluten-free nutrition. In addition to her Nutrition and Wellness certification through American Fitness Professionals and Associates, Aimee has a bachelor’s degree in business/marketing from California State University, Long Beach. She is the author of The Whole Pregnancy: A Complete Nutrition Plan for Gluten-Free Moms to Be.